A clash among Ethiopian soldiers who are stationed at Bure Front, a small disputed area on the border between Eritrea and Ethiopia that started on Tuesday 25, 2012 has taken the life of over 40 soldiers while 39 were wounded. The wounded are being treated at Manda Hospital. Perceiving that war between Ethiopia and Eritrea had erupted, residents were reportedly leaving the area. High ranking military officials were roving the area with helicopters in an attempt to control the violence, there were various speculations about the cause of the violence: some said it was caused due to disagreements between TPLF army officials while others say it was a clash between groups that support the leadership and those that oppose it. Bure is 50 miles west of Asseb. 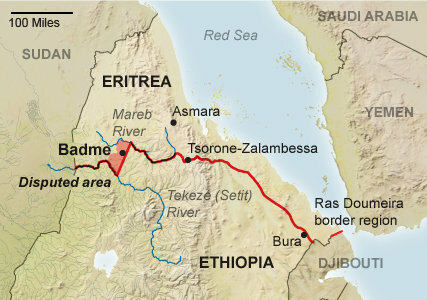 Eritrea considers Bure to be a part of its Southern Red Sea Zone, while Ethiopia considers Bure part of Administrative Zone 1 of its Afar Region. This area lies across the important Awash-Asseb highway, which in the past has been an important trucking route.The Front is lead by General Saere Mekonen.